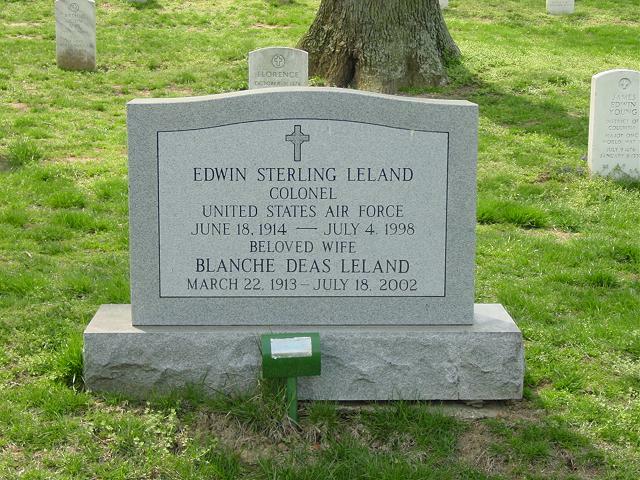 Edwin S. Leland, 84, an Air Force colonel and lawyer who retired 30 years ago as inspector general of the Defense Intelligence Agency, died of congestive heart failure July 4, 1998 at The Fairfax retirement community at Fort Belvoir, Virginia. He was a native of Meridian, Mississippi., who had lived in the Washington area off and on since the 1930s. He was a graduate of the University of Alabama, the Armed Forces Staff College and the Air War College. He served in the Army Air Forces in the South Pacific and Europe during World War II and was in law practice in Gulfport, Mississippi, for two years after the war. After returning to active duty, he served in Okinawa and France. His other posts included chief of plans for Air Force intelligence, deputy executive assistant to the secretary of the Air Force and dean of the faculty at the Air War College. Cololonel Leland was awarded the Legion of Merit three times. He was a member of Pohick Episcopal Church in Fairfax and Kappa Alpha social fraternity. Survivors include his wife of 62 years, Blanche Deas Leland of Fort Belvoir; three children, retired Army Lt. Gen. Edwin S. Leland Jr. of Baltimore, Richard D. Leland of Burke and Candace L. Porter of Devon, Pa.; seven grandchildren; and two great-grandchildren. On Saturday, July 4, 1998, at his home in Ft. Belvoir, Virginia; beloved husband of Blanche Deas Leland; loving father of Lieutenant General Edwin S. Leland Jr., USA (Ret. ), Richard D. Leland and Candace L. Porter. Also survived by seven grandchildren and two great-grandchildren. Services will be held on Thursday, July 23 at 1 p.m. at Ft. Myer (Old Post) Chapel. Interment Arlington National Cemetery. In lieu of flowers, memorial contributions may be made to the Columbia Lighthouse for the Blind, 1421 P St., NW, Washington, DC 20020.